Be ready to vote for Hillary. Bernie Sanders wants to confront and end mass incarceration. Hillary Clinton is now talking about these issues too, though until recently, her campaign was heavily financed by the private prison companies. In college, my friends and I lead a powerful campaign against the Corrections Corporation of America (CCA) and its largest corporate investor at the time, Sodexho-Marriott. It was a fight that I took personally. I had seen the growth of the private prison industry my hometown of Grants, New Mexico. The town had collapsed, much like a lot of the American middle-class, during the Reagan years. I also saw the carcel state target my poor and working-class, Latino, Indigenous and white neighbors. During the Reagan, Bush and Clinton presidencies the US became the world leader in locking up its own citizens. As the Grants economy cratered, our family’s fortunes slipped into the same hole. The uranium mine closed and my dad was out of work. At one point I remember us all living in the den of our small home where the fire place was. Our house was cold. The gas had been cut off. My mother found work as a prison guard at a CCA facility. Working as a corrections officer crushed my mother’s soul. She left that job in a depression from which she would never recover. Years later, I became a miner like my father. We followed the work across the southwest and eventually to Alaska, where I was fired from a mine for trying to organize and win a lunch break. I went to college determined to make a difference for working people like my mother, my father and my former co-workers. I explored lots of outlets for my passion. I was a student volunteer. I was in student government at Mesa Community College. It wasn’t until I discovered activism that it all finally clicked. After trying and failing to organize a couple of protests, I found other students who understood that filling soup bowls and voting weren’t going to add up to the change that we wanted. We talked about what we believed for months over beers and coffees. We figured out that we were socialists. 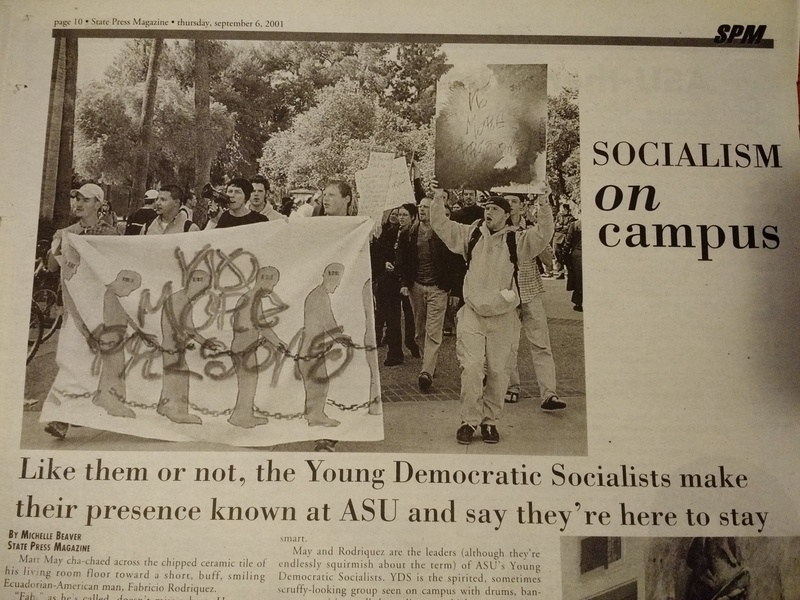 My good friend Matt May did some research and connected us with the Young Democratic Socialists (YDS). Later I became the YDS National Co-Chair. By my third year, I had moved from the community college to Arizona State University. A core of friends lived in the same group house, and we began to flex our organizer muscles. We decided to fight against our school’s connection to CCA. In doing so, we would take away our university’s support of the private prison company and have thousands of students and alumni begin to at least question mass incarceration. Twelve years later, we are finally having an national conversation about this. Under the guidance of YDS staff and No More Prisons staff, Daraka Larimore-Hall and Kevin Pranis (I credit these two men with turning me into an organizer and a radical), we learned how to run an organizing campaign. It was not only that we learned and deployed direct-action organizing to massive success that made that organizing exciting. It was also that we did it under the banner of the Young Democratic Socialists on a very conservative campus. We were not simply wielding real power in a Arizona; we were doing it within an ideological framework that inspired and motivated us. Democratic Socialism opened up so many possibilities in my evolving political imagination. Through the Young Democratic Socialists, we had relationships with other young socialists all around the world. We knew not only that these social benefits were common in many countries, but that, on balance, they were more efficient and affordable than any ham-handed, privatized, watered-down American versions. My friends and I learned that the world could be different. We developed our values over late night reading group debates that were endlessly more interesting than what we were being taught in our classes. We risked going to jail together during a student occupation of an administration office and sit-in we led to break the ties between our school and CCA. It was the first time that civil disobedience had happened at Arizona State University in decades. At the end of our two-year campaign, in 2003, Sodexho-Marriott, in one of the largest corporate divestitures ever, dumped $10 million in CCA shares(we were joined by other YDS activists on other campuses around the nation). To this day, I remain a dedicated Democratic Socialist (dues check is totally “in the mail,” Democratic Socialists of America). They taught me the power of audacious political imagination. And I’ve been hoping for this Democratic Socialist moment for a long time. That doesn’t mean I ever dreamed the day would come when a self-identified Democratic Socialist would gain any traction running to be the Presidential nominee of the Democratic Party. I love Bernie Sanders. I think that his prominence has changed the debate in this country forever. But, the truth is, he will not win the nomination. It is just mathematically, not possible. Even still, if Bernie will continue to run, as he has said that he will, then we need to keep fighting for him, keep getting people to vote for him and keep donating. What do you think “Feel The Bern” means, after all? Donald Trump’s slogan, “Make America Great Again,” indicates moving backward to some imaginary time when things were better for his supporters. His rhetoric is loaded with indications of racial and gender privileges that are slowly vanishing. Hillary Clinton’s slogan, “Hillary Clinton for America,” is, much like her, as exciting as a lukewarm glass of skim milk. It says nothing of the future. It has no aspirations. It is simply a call to stay the path. It is a call for the here and now. Realism. Bernie Sander’s slogan, though, “Feel The Bern,” has an obvious connection to the self-improvement and the hard-work we do in the gym. It is aspirational. It is about the future. It is about about persistence, struggle and gain. It certainly doesn’t indicate that we should quit just because we won’t get everything we want in the next few months. Of course not. That is as silly as Clinton supporters who say they want universal health care, but are being “realistic” so they are going to vote for the candidate that does not support universal health care. How does it make any sense to vote for someone who is against what you want in the hope that you will still get it somehow? We need to keep fighting and keep supporting Bernie all the way to the convention in Philadelphia. When the convention opens in Philadelphia, I will be glad to resume the activity I took up at the only other Democratic National Convention I have ever been to, the DNC in 2000. That is what it is going to take. More organizing and more struggle. We have to go all the way to the convention and beyond. Yes, we need to protest against Hillary if we want her to fight for what we want. When the primary happens in Pennsylvania. I will vote for Bernie. You should too. In fact, if you want even a modestly progressive Hillary as President, you must vote for Bernie Sanders in the primary. Otherwise, Hillary Clinton is more likely to begin seeking the votes of the disaffected conservative Republicans as they jump off the sinking yacht that is their party. If you don’t vote for Bernie, Hillary will triangulate toward the right, rather than keep sliding left to appeal to us. Especially if Bernie leaves the race before the convention. Unless we keep fighting for Bernie Sanders, Hillary Clinton will quickly retreat to the Reagan-lite brand that she and her husband created in the 1990s. Make no mistake, once the dust has settled, Bernie Sanders will gracefully bow out. Hillary Clinton will become the nominee. When the General Election comes, I will, out of sheer self-preservation, vote for her. I won’t like it,but, I will do it because above all else a Democratic Socialist believes in solidarity. I will vote for Hillary Clinton because I love the working people that are suffering under capitalism. We cannot sacrifice them just to stick it to the corrupt, corporatized Democratic Party. We cannot sit back and let the Conservative Republican Authoritarian Party (CRAP) under Trump (or any of their extremist candidates) unleash their terrible, hateful revenge on the progress of mankind. If you “Feel The Bern” truly, then continue to fight. If you “Feel The Bern” truly, then you must commit to continuing to work hard. Commit to organize up to and beyond the convention, to protect the people and to fight for a better future. You cannot sit out the General Election when Hillary is the nominee. If you do, then Trump may actually get his wish: walls along our borders, built and paid for by Mexico and Canada. Their purpose, however, will be to block the wave of American refugees fleeing from the rising fascist tide. *I am not a spokesperson for the Democratic Socialists of America, the Young Democratic Socialists or the Bernie Sanders campaign. Previous Post How will we treat the “least” among us? How will we treat Comcast? Next Post How Bus Riders Won a Huge $2.1 Billion Surprise Victory in Charleston.